Got a Keurig Mini coffee brewer? Most small travel mugs don’t fit under the K10 or B31 Mini brewers although the new Keurig K-Mini brewers give you more space for a taller mug. Even still you have to really go out of your way to find a good insulated travel mug for one of these small machines but they are around if you do some digging. I have an older post on keurig sized mugs but I wanted to highlight the mini brewing machines in it’s own post because, well, your options are much more limited and you can’t just buy a small mug and assume it will fit. I posted a video on Youtube in which I discuss the dimensions of the mugs. You can see the video on YouTube here or just watch it as I’ve embedded it below. The opening on an older Keurig mini is four inches and if you remove the drip tray the opening expands to five inches. In most of the larger Keurig brewers the opening with the drip tray removed is around 5 3/4″ so this is noticeably smaller. For a travel mug to fit the Keurig Mini it needs to measure less than 5 inches in height with the lid removed. I’ve narrowed the field down to three really excellent insulated travel mugs that are small enough to fit into this space and listed them below. 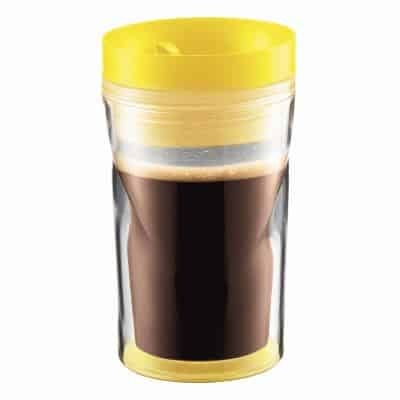 The 9.5 ounce Oxo Mini travel mug barely fits under the Keurig Mini brewers so long as you remove the lid to the mug and the drip tray for the brewer. It is exactly 5 inches tall sans lid so it’s a tight squeeze but it’s probably the best performing mug in this size range. If you want a mug that will really give you good insulation then this is the best option of the three listed on this page. The mug is also very leak resistant too which is great for the car. 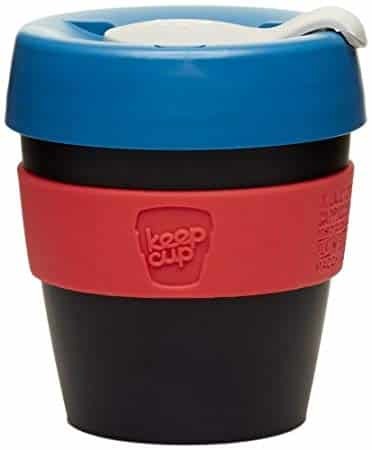 If you want something that’s slightly insulated and really small then you have to go with Keepcup’s 8oz mugs. They come in many different color combinations and they are made of a somewhat flexible silicone like plastic. Much like a paper cup can flex a bit these cups will do the same. You can expect this cup (with it’s lid) to keep your coffee hot longer than a basic coffee mug but not more longer than 30-40 minutes. It’s super short too so you can easily get it to fit under a mini Keurig brewer, either the B30, B31, or K10. A lot like the Oxo Mini featured above this mug is 5 inches exactly when the lid is removed making it a perfect fit for the smallest Keurig brewers. This mug isn’t going to be be quite as thermally insulated but it will keep things hot for up to an hour depending on how fast you drink your morning coffee. For the road this is actually a great mug because you can drink from anywhere on the lid’s circumference. You can seal it so it doesn’t leak or spill and there’s no handle to get in the way. I’m fond of this mug but it can be hard to find in stock at times. In any event I hope this helps you out just a bit. I’ve listed the mugs I would buy for the owner of a Mini single cup coffee maker in order of my preference but they all are worth buying if you ask me. Also, If you are shopping for a mug to fit under a Keurig K-Mini coffee maker then your options are a lot larger. The K-Mini was redesigned to offer a much taller opening for the mug. Even with the drip tray in place you can fit most small travel mugs under the spout. In fact you’ll probably be able to use nearly any small sized insulated mug you want. The opening accommodates anything up to seven inches tall when you remove the drip tray. This is far more space than is needed for a single cup Keurig machine in my opinion but it does make things easier on you. Anyway, make sure to check out my page for insulated espresso mugs and cups if you are looking for that sort of thing. Most mugs featured on that page aren’t going to be road worthy but will be great for around the house. 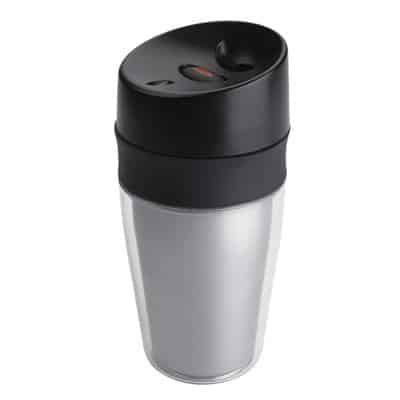 For commuting or general portability then stick with an stainless steel tumbler like those featured above or over on this page.